The new Sullivan Scholars represent 17 school districts throughout Georgia. VALDOSTA — Thirty-eight high school juniors and seniors were recently welcomed into the Valdosta State University Sullivan Scholar Program, which seeks to recruit and educate high-quality teachers for rural schools in Georgia by offering college scholarships to future educators. 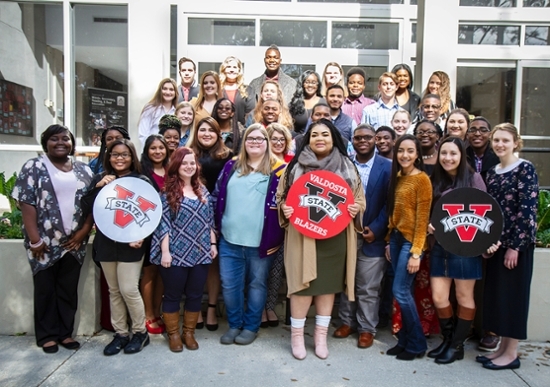 The new Sullivan Scholars — representing 17 school districts throughout the state — will begin attending VSU in Fall 2019 or Fall 2020. They all have a high grade point average, a passion for becoming a teacher, and significant financial need. They are Shardajia McCloud and Demetrious Miles-Bidot (Pelham City High School); Torrence Weaver, Lindsey White, Morgan Morris, Haley Bass, Dylan Taylor, Jimmy Cruz-Rojas, and Elsa Gonzalez (Jeff Davis High School); Talvin Daniels (Miller County High School); Charles Grissom and Naya Whitus (Mitchell County High School); Courtney Robinson (Berrien High School); Nelleah Shellman, Breanna Tinney, Marquel Harrison, and Jennifer Jimenez (Brooks County High School); Michael Addison and Kara Welch (Cairo High School); Anna Sapp (Lanier County High School); Candace Craddock, Kristina Bowden, and Aaliyah Ross (Fitzgerald High School); Hector Bueno, Emily Culpepper, and Brooke Culpepper (Echols County High School); Elisabeth Peeler (McIntosh County Academy); Justin Carter, Ja’len Smith, George (Tripp) Fleming (Valdosta High School), and DeAndre Harris (Valdosta Early College Academy); Nia Hackney and Sara Simcox (North Cobb High School); Katherine Bishop (Columbus High School); Debora Gonzalez-Herrera and Carola Rosario (Lowndes High School); Michelle Mitchell (Dublin High School); and Dashia Marshall (Irwin County High School). The scholarship recipients were recognized at the recent Sullivan Education Summit, a gathering at VSU that included high school parents, superintendents, principals, teachers, and counselors, as well as higher education administrators, faculty, and staff. The event assisted new Sullivan Scholars and their families in the coming transition to college and also explored strategies for bringing quality teachers to rural areas and ensuring all rural students succeed. The VSU Sullivan Scholar Program provides a debt-free college experience for participants and covers all college-related expenses, including tuition, books, housing, and meals. The amount given to each student varies depending on the additional financial aid, such as the HOPE Scholarship or Pell Grant, that he or she receives. Participants will also receive a $400 stipend each semester while in college. If participants choose to teach at a rural school in Georgia after graduating from VSU, they will receive a $2,500 stipend per year for their first two years of teaching. “Rural schools in our region and state struggle to attract and keep good teachers; we’re hoping our program changes that,” said Dr. Karla Hull, professor of curriculum, leadership, and technology at VSU and executive director of the VSU Sullivan Scholar Program. “The core purpose of this program is not only to offer a quality teaching education to students from rural areas who otherwise may not get such an opportunity, but also to encourage those students to teach in low-income areas in Georgia after graduation. The VSU Sullivan Scholar Program is made possible by the generosity of Ruby R. Sullivan, a Camilla, Georgia, native who obtained an education degree from Georgia State Woman’s College (now VSU) in 1932. Sullivan spent 67 years as an educator, dedicating her life to teaching students in high-poverty schools in rural Georgia. She passed away in 2017 at the age of 103. Her passion for serving others led her to create the VSU Sullivan Scholar Program. Sullivan’s previous donations to VSU created the Ruby and John Sullivan Scholarship for education majors. The VSU Sullivan Scholar Program is invitation-only and based on need and merit. To be eligible, high school juniors or seniors must attend a rural Georgia high school; receive at least two nominations from a teacher, guidance counselor, or principal; have a desire to attend VSU and become a teacher; maintain a 3.0 grade point average or higher while in high school; have a significant need for financial aid to attend college; be eligible for the HOPE Scholarship; and meet VSU admission requirements. At VSU, participants must maintain a 3.0 grade point average and gain admission into a teacher preparation program within the James L. and Dorothy H. Dewar College of Education and Human Services. Contact Dr. Karla Hull at sullivanscholars@valdosta.edu or 229-219-1324 to learn more.